It’s been so hot lately that it seems like every day is an ice cream kind of day. In reality, the weather is just an excuse to go out and get something cool and refreshing like ice cream. But let’s be honest, I don’t really need an excuse because in my world, every day is an ice cream kind of day. I’ve had ice cream in extremely hot conditions and I’ve gone out and gotten ice cream when the temperature has been in the single digits. I don’t discriminate because ice cream is one of my all time favorite treats. About a year ago, a new ice cream place opened up in our neighborhood, but no matter how many times I mentioned it to my husband, he never had any interest in checking it out. Then all of a sudden, one day, when we were driving by, he said, “hey, maybe we should check out this new ice cream place you mentioned.” Finally! 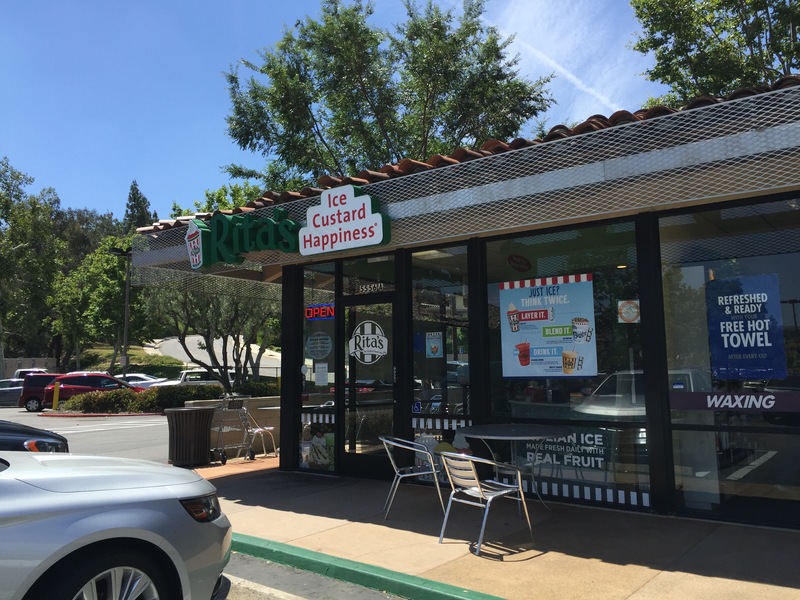 Rita’s Ice Custard Happiness isn’t your regular ice cream shop. In fact, they don’t sell ice cream at all. Instead, they offer Italian ice and custard. Italian ice, like sorbet, is made with real fruit or fruit flavorings mixed with ice. Unlike shaved ice which is ice flavored with fruit flavors, Italian ice is mixed much like ice cream is where the ice and the fruit are frozen together as they are mixed in the same process as ice cream. Italian ice is similar to sorbet and is believed to be so named after Sicilian granita. Frozen custard is creamier and richer than ice cream in that it contains eggs as well as cream and sugar. 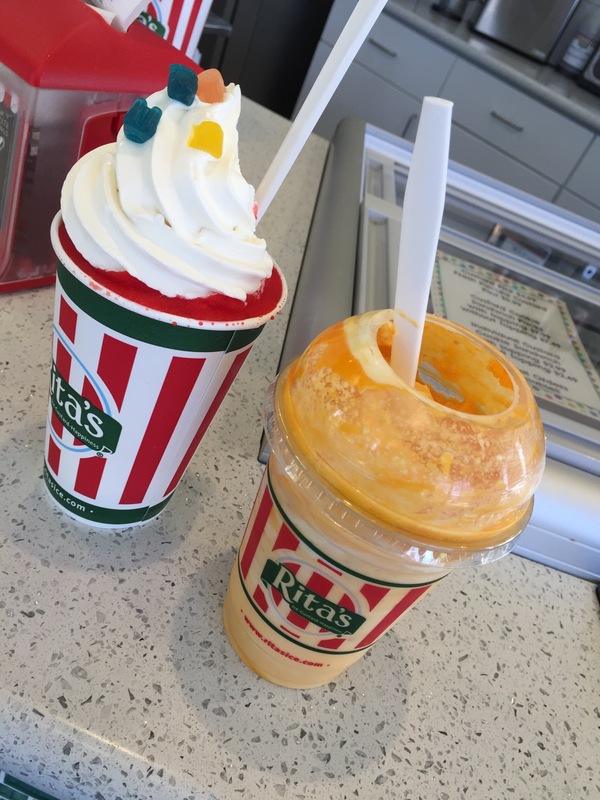 Using the Italian ice and frozen custard, Rita’s creates different combinations of delicious, icy treats. As they advertise, you can blend it, drink it, or layer it. 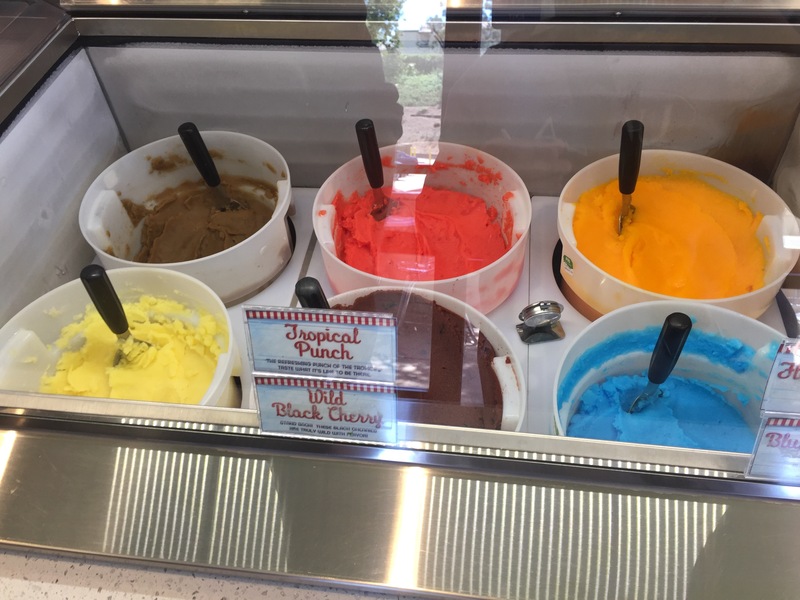 There are various combinations that include just using the Italian ice or just using the frozen custard, but there are other creations that use a mixture of both Italian ice and frozen custard. 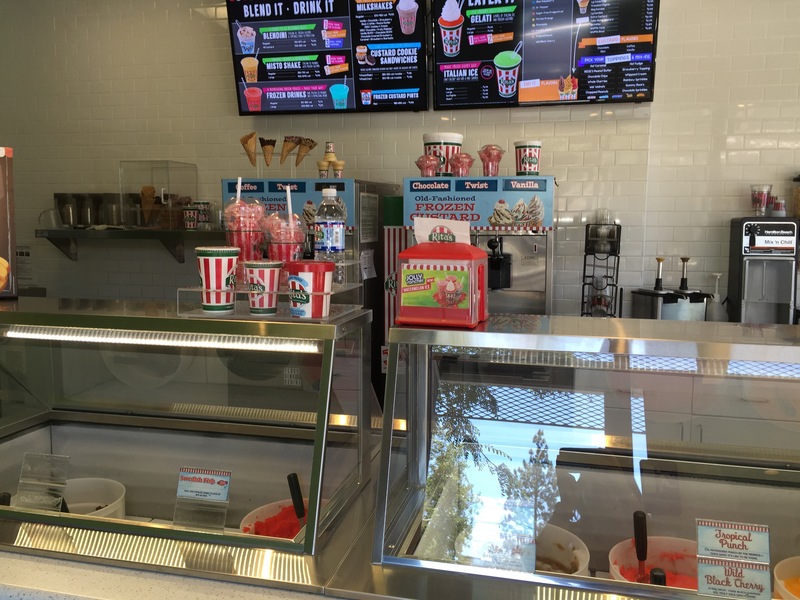 Frozen custard flavors can change daily based upon what’s been churned as Rita’s creates Italian ice and frozen custard flavors on a daily basis to make their offerings as fresh as possible. On the day we visited, the frozen custard flavors offered were chocolate, vanilla, mint and coffee. Of course, flavors could be mixed and combined to create amazing sundaes or even just frozen custard on a cone. Italian ice flavors were much more creative as there are tons of fruit flavor options. And if you don’t know what you’re looking for or what anything tastes like, Rita’s is nice enough to offer samples before you choose. The Italian ice flavors are so colorful as well. Along the back row (L to R) was Dr. Pepper, Tropical Punch and Florida Orange. It’s amazing how much Italian ice really is creamy like ice cream, and yet you know its ice and not cream. The front row (L to R) consisted of Pineapple, Wild Black Cherry and Blue Raspberry. There were additional flavors in the next case, including Dragonfruit and Swedish Fish. Apparently, they also had Mango as well, which I definitely would have ordered, except that it was currently been mixed in the kitchen and wouldn’t be ready for a little bit of time. That was kind of disappointing as Mango is my favorite. For my husband’s treat, he chose a the Gelati which is a cup full of Italian ice topped with a swirl of frozen custard. After looking through his Italian ice options, he chose Swedish Fish for the Italian ice topped with some vanilla frozen custard. 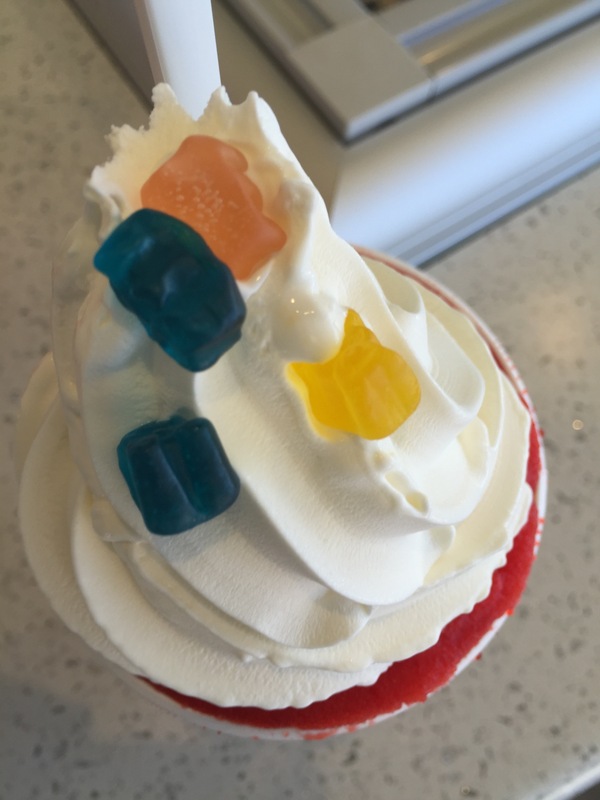 He also asked for a topping of some gummy bears atop his frozen custard. 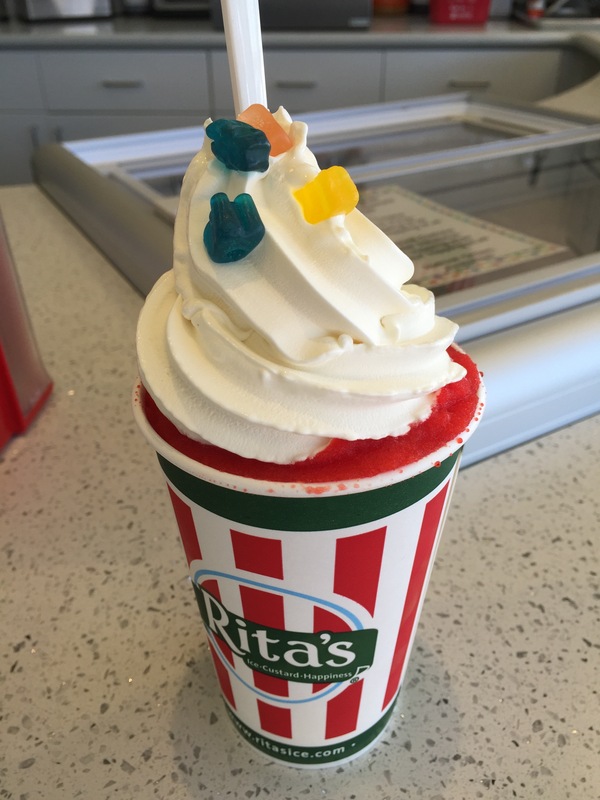 A gelati is a great combination of being able to have both Italian ice and frozen custard in one dessert. The Swedish Fish Italian ice was creamy and smooth and a great combination between shave ice and ice cream; you can taste that this is icy and not creamy, but it’s so full of flavor and so compact that it almost has the mouth feel and consistency of ice cream. The Frozen custard on the other hand is amazing, it’s so thick and creamy. One spoonful and it’s obvious this isn’t ice cream. It’s thick, almost the way you think of Turkish coffee vs regular coffee. You can taste the flavor, quality and difference with the frozen custard, it’s creamy and delicious. Taking a spoonful that gets you a little bit of Italian ice and a little bit of frozen custard creates a wonderful combination, not only of flavor, but also texture of the different types of icy desserts. 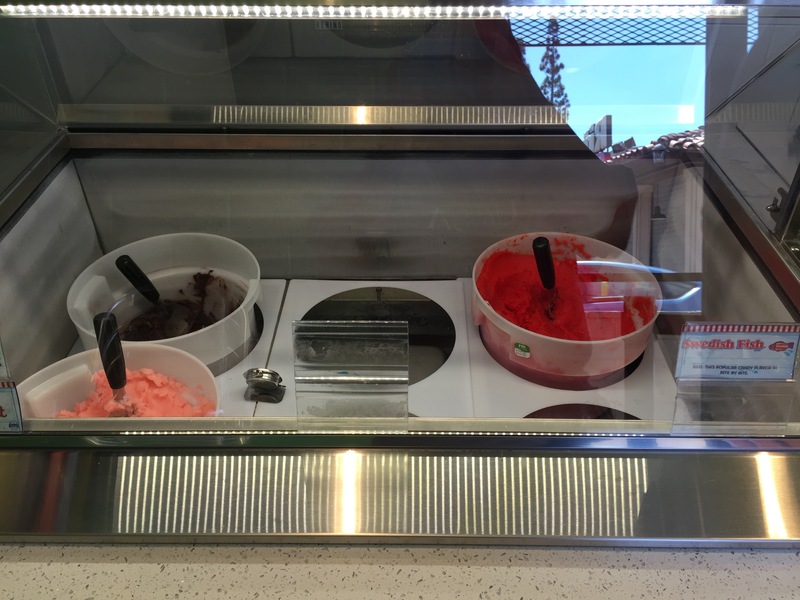 The gelati is a great way to sample both the Italian ice and the frozen custard and my husband was really surprised and blown away by how good the combination of the two desserts was. He walked into Rita’s a bit skeptical about what they had to offer, and walked out really enjoying his dessert. I decided to also get a dessert that combined Italian ice and frozen custard, but in a different way than my husband’s gelati. I ordered a blendini where the frozen custard and Italian ice is blended together along with a topping to make a frozen, blended dessert. You start by choosing one flavor of custard, one flavor of Italian ice and one topping. My choices were Florida’s orange Italian ice, vanilla frozen custard and nilla wafers. The blendini starts with a scoop of Florida’s orange Italian ice in the bottom of the cup, topped with a layer of vanilla frozen custard, a couple of spoonfuls of nilla wafers top that, and then the cup is filled to the brim with more Italian ice. The lid is put on the cup, and then the cup is inserted into a machine, similar to a milkshake machine that blends the various layers of topping, Italian ice and frozen custard together into one cohesive dessert where there are no longer three distinct ingredient layers, but rather one cohesive frozen dessert, a blendini. My blendini tasted exactly like an orange creamsicle, it was fantastic. 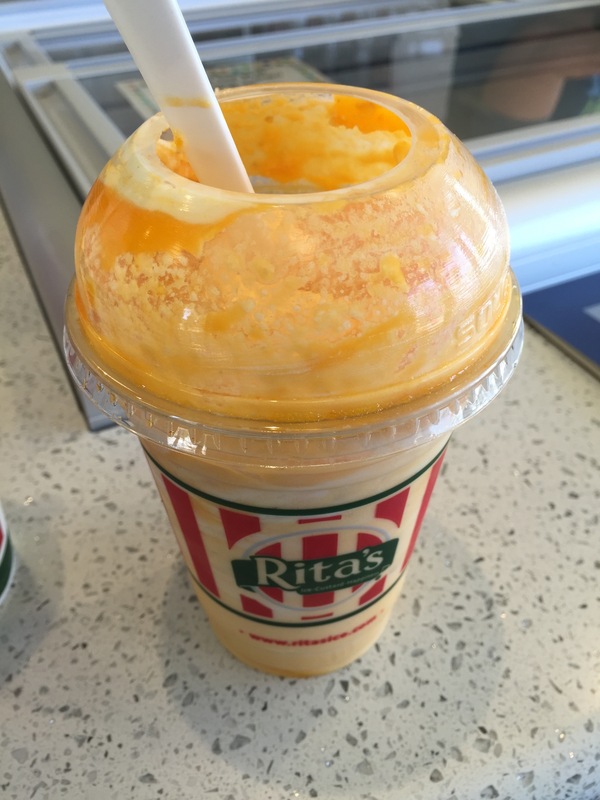 Orange and tangy throughout with the Italian ice, and thick and creamy from the frozen custard mixed into it. The crunch and texture change from the nilla wafer was terrific and delicious. This was one refreshing and cool icy dessert that I really enjoyed. It was a little different and new too from your traditional ice cream dessert, and that was much appreciated. My husband who was apprehensive about going to Rita’s Ice Custard Happiness walked out of the store a convert at our first trip. He loved not only the Italian ice, but also the frozen custard, and he especially loved the idea of combining the two different icy desserts into his gelati dessert. I loved the fact that this was different and quite unexpected, and also really delicious and refreshing as well. Rita’s Ice Custard Happiness has made us so happy that even though it took us over a year to discover this new joint in our neighborhood, within the past few months, we’ve actually visited a couple of times now and I’m sure as we enter summer, we’ll be visiting a bunch more times.